Upadte July 30, 2013 - Full resolution mason jar photos are now available as free printables. She's finally done!! I am so excited. My hubby took a thousand couple of pictures of the jars for me to choose from. Then we ordered the 11 X14 prints. We already had the frames, but they were black, so we spray painted them a high gloss white. 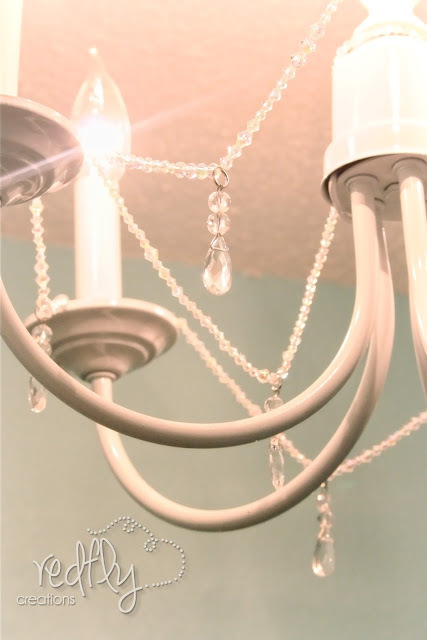 Remember these chandeliers that I got at a garage sale in the fall? One was $3 and the other $2. Well, the black one is no longer black. It also got painted the high gloss white, and I strung some beads to give it a little "bling". ....and on the other corner of the shelf. What do you think? 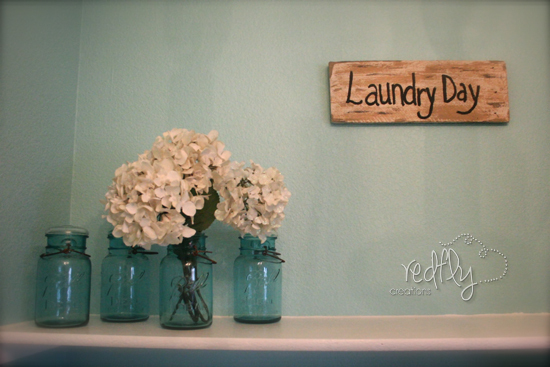 What do you have dreamed up for your laundry room? The luandry room design was inspired by photographer Cindy Mandernach. She does great work! What color paint is that?? That's a fancy laundry room. 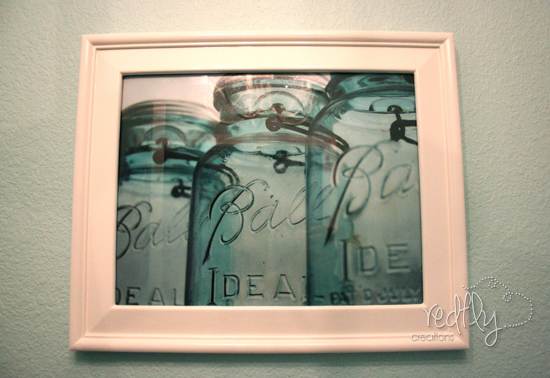 Love the pictures of the jars, and the fact that they are family heirlooms! My laundry room needs alot of work . There's one single lightbulb in the middle of the room! Yes, family heirlooms are very special. I always love it when I can incorporate them into a room. 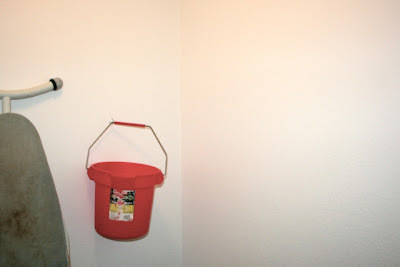 You'll have to let me know if you get inspired for your laundry room.... ;0) I'd love to see what you'd do with it! Beautiful! I am dreaming of an actual room, not just a cubbie. Your pics do inspire me. I think it is going to be my main project this spring. Thanks for sharing! Great Ohio Mom! So glad it could be an inspiration. Such a pretty room would make me want to keep it clean and even do the laundry! Thanks for sharing! Oh wow wow wow! That is amazing - I'd want to move in and sleep there :) I don't have a laundry room and I'm not sure I could do this. Your jars look fantastic too - just perfect. Any ideas for a pantry?? I actually do have several pantry ideas up my sleeve, just haven't gotten there yet......but soon. Thanks for stopping by. Thank you Julie for stopping by and leaving such a sweet comment. I too began following you via linky followers. SO pretty! 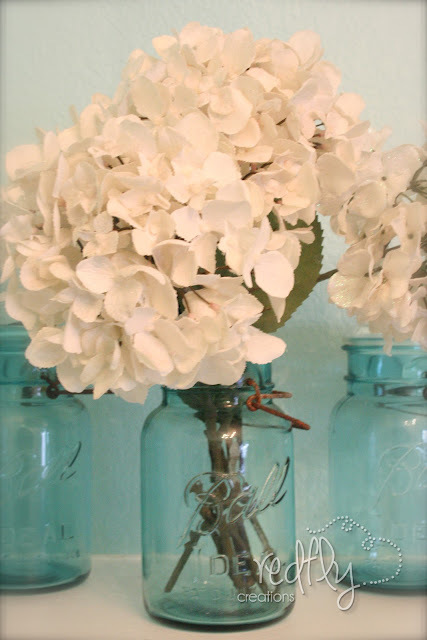 I absolutely love mason jars & I love your blue walls!! Pretty color. 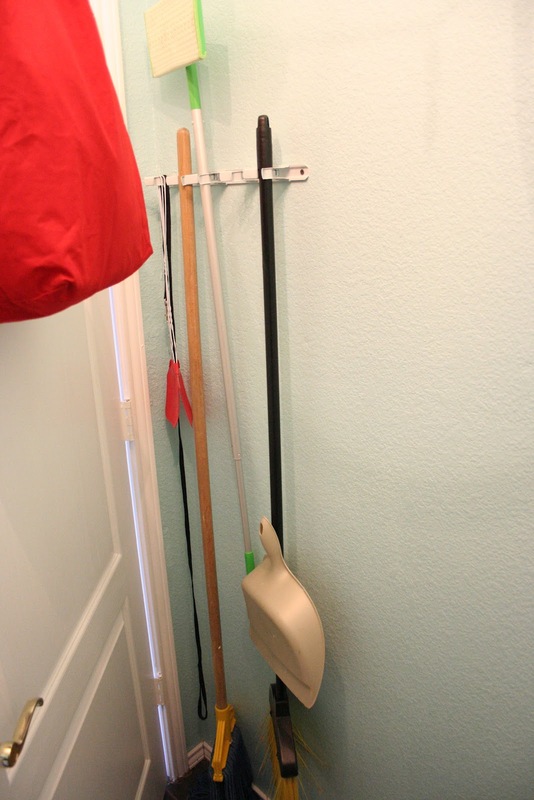 I wonder if I'd do more laundry if I made over my laundry closet? Very cute! I love how you took pictures of the jars! What a gorgeous laundry room! We recently did an overhaul on our laundry room too and I cannot believe the difference it makes. Well, it was pretty bad, serving as laundry, pantry and the place where all the homeless stuff went. Glad to have you visit and I'm now linky following you! Thank you Sherry for taking the time to stop by and leave a sweet comment. Thank you too for becoming a follower. Wow! What an amazing laundry room! I looooove the jar prints on the wall! Thanks for the invite and for becoming a follower. I linked up at your party and became your linky follower as well. WONDERFUL!!!!!!!!!!!! Can you come re-do mine PLEASE?! Thank you Christine for the compliment! I stopped by and linked up to your party. This is beautiful! I am in love with blue mason jars. I would love if you would share this at my party. Hi Kelly. Thanks for stopping by. I linked up to your Fab. Friday linky party. Thanks again for the invite. So glad you found my blog! I also loved the mason jar madness.........figured this was the best way to incorporate it. Thanks again for taking the time to stop and chat. Just became a follower and LOVE your laundry room!! Amazing! Thanks Meegan, and thanks for becoming a follower. Following right back. p.s. it was a great day! Your laundry room is precious! I love the pics of the Ball jars and are totally copying this!!! Thank you for sharing. I'm your newest fan! Please stop by bellanest.blogspot.com if you get a chance! I love your room, so fun and cheery! Your husband's pictures are amazing! Seriously cool!! you must just love it!!! it looks great! Our laundry room is a big part of our house because I do do much laundry..... and we too. 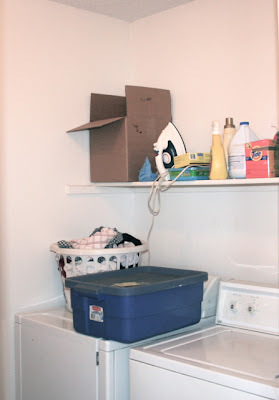 put a lot of effort into our laundry room design!! and i still love it! So super cute. I am your newest follower. No way !! That's the color I used, and accented w chocolate brown. Isn't a pretty laundry room fun? Stop by and check mine out. It's under my Organizing tab. Good for you! It looks beautiful! Love the color! Thanks so much for linking up to The Creative Spark - I'll be featuring this today! Enjoy the rest of your weekend and I hope to see you again on Tuesday night! Love your new laundry room. You did a fantastic job, now doing laundry is fun! 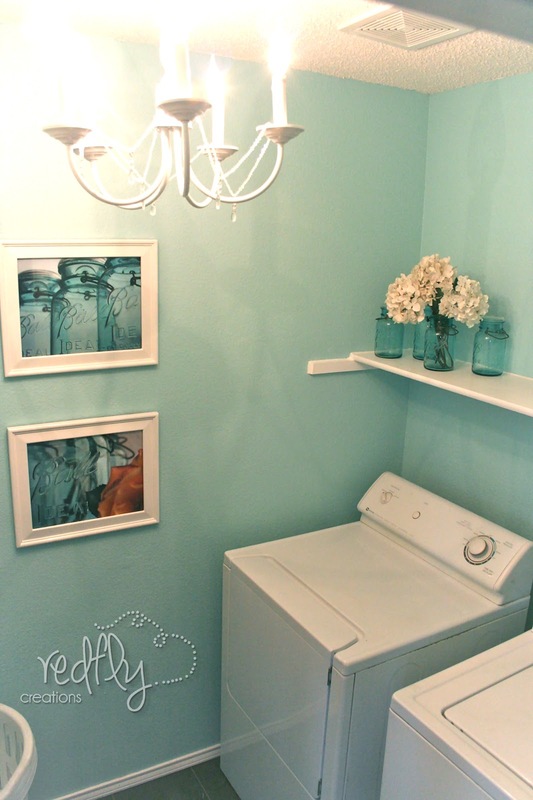 What a pretty color you chose for your laundry room! It now seems more peaceful and relaxing. I also like how you revamped your chandelier and added the strings of beads! Thank you for sharing this at my link party! Love the colour of your laundry room and love the mason jars both on the shelf and in the photo. I put my laundry detergent in a large tin that coordinated with my laundry room and I've seen it stored in large glass canisters. It is a bit of a pain to dump it out, but it is such a pretty finishing touch. You could even put the whole box in a wicker basket to prettify it up. I bet you enjoy doing laundry a whole lot more now that your room is so pretty. Thanks for the idea Grace. I love those jar prints! 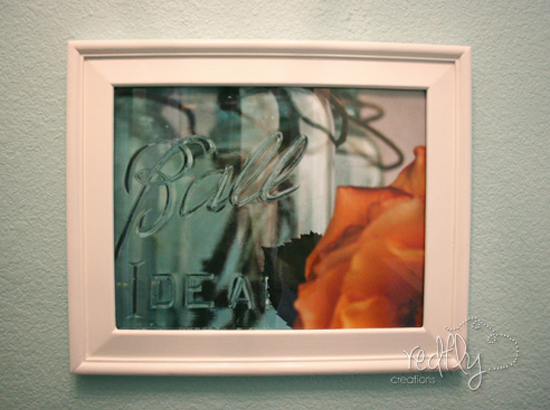 They add a classy touch to an otherwise mundane room! I really want this laundry room. It is gorgeous and nothing like the dungeon I have. Great makeover! Gorgeous! I wish I could do this to my laundry room but it's in the basement with the pipes exposed with all their switches. So I can't paint the walls. This is beautiful! That mason jar art is just fantastic! Love, love your transformation! I really just love this so much! Gorgeous! I especially love the light fixture redo. You simply drop off your dirty laundry and we'll finish up. Visit here for more interesting information on About - Laundry Owner.